The National Highway Traffic Safety Administration (NHTSA) has expanded the Takata airbag recall to include an additional 2.7 million airbags in vehicles sold by Ford, Nissan and Mazda. The recent expansion comes after Honda reported a 12th American was killed by a faulty Takata airbag in June 2016. This latest death raises the number of known fatalities caused by Takata airbags to 18 worldwide, while approximately 180 people have been injured. The Edwards Law Firm’s Takata airbag attorneys in Tulsa are ready to provide experienced legal help to victims who have been injured by a defective device such as this. We will provide you with a free, no-obligation consultation to find out if you are entitled to file a Takata airbag lawsuit to recover compensation for your injuries and other damages you have suffered. Contact us today. Ford has yet to identify its models affected by the latest recall. However, the NHTSA maintains a Safety Issues and Recall list that you can use your vehicle’s VIN to find out if it is part of the Takata recall. The most recent Takata airbag recall involves the device’s airbag inflators, which use calcium sulfate as a drying agent to counteract the ammonium nitrate propellant, which forces the airbag to inflate upon impact. However, ammonium nitrate has been found to decay over time, which can lead to the airbag exploding if too much force is applied to it. This explosion sends shrapnel flying at high speeds throughout the interior of the vehicle. Takata originally claimed that airbags with a drying agent, called a desiccant, were safe and only those without a desiccant had a chance to explode. The desiccant was believed to stop the ammonium nitrate from decaying and becoming dangerous. However, the NHTSA recently announced that safety tests performed by Takata show using calcium sulfate as a desiccant for ammonium nitrate airbags could pose a danger to motorists if not replaced. So far, airbag inflators with calcium sulfate as a desiccant are the only type of airbag with a desiccant that has been recalled. The latest death confirmed to have been caused by a malfunctioning Takata airbag occurred on June 18, 2016 in Hialeah, FL. In a statement released by Honda, the company reported that the victim was using a hammer to make unknown repairs to a 2001 Honda Accord while he was inside the vehicle. As the victim was making repairs, Honda claims that the vehicle’s ignition switch was in the “on” position. At some point during the repairs, the victim activated the airbag inflator, which ruptured as it exploded. The victim, who did not own the vehicle, died later the next day from his injuries. Since 2009, the vehicle had been included in several recall notices, as well as a safety campaign targeted toward the vehicle’s defective Takata airbag inflator, according to Honda. During the course of seven years since the first recall was issued, 12 mailed recall notices were sent to various owners of the vehicle before the June 2016 incident occurred. However, the recall repairs were never completed, according to Honda. The Takata airbag recall is the largest automotive recall in U.S. history and involves 19 automakers and millions of vehicles with defective airbags. 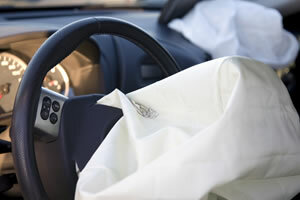 However, despite its magnitude, less than one-third of recalled airbags in the U.S. have been repaired. The lack of repairs was initially attributed to Takata’s inability to produce enough replacement parts needed to quickly repair the defective devices. Furthermore, many of the vehicles involved in the recall are older models and have been sold multiple times, making it difficult to inform the current owner of the recall. Takata has been fined millions of dollars in legal fees and penalties throughout the course of the recall, and in June 2017, the company declared bankruptcy. Our dedicated personal injury attorneys in Tulsa are ready to help victims of negligence take legal action to recover the compensation they deserve for their pain and suffering. Do not hesitate to contact us for a free, no-obligation consultation to find out if you have legal options after being injured by a defective Takata airbag. We only work on a contingency fee basis and do not get paid unless you receive compensation.